The products from Lunch van huis are made in our own kitchen and are freshly prepared daily. Handmade, pure delicacies. Our lunch is prepared without unnecessary additives and we do not produce unhealthy snacks. That way Lunch van huis knows exactly what we serve. Deliciously simple! A delightful daily lunch thanks to beautiful and pure products. Delivery and company catering in one. From € 3.75 per person per lunch. A perfect standard for lunch and made to measure to your personal wishes. Request a trial week with 20% discount! A homemade lunch every day without any worries! Lunch van huis delivers a great lunch every day for the office or somewhere else. How do we do it? We prepare the lunch in our own kitchen. From jam to sprinkles to baking bread. We deliver our buffet boxes for lunch, including plates, glasses and cutlery if needed. That way everything is ready before you all sit down. After lunch we pick up the buffet boxes. From company catering to healthcare catering to school catering. We deliver a tasty and healthy lunch at an affordable price. Because we produce everything in one central location, we have control over the quality of the lunch. And all the products? We produce these from our own kitchen. No ready-made pots, but handmade and homemade. We make sure the lunch is ready and that everything is picked up again. And because we are not on property before, during or after lunch, we keep the costs low and you only pay for the quality. Our Buffet boxes are specially designed to ensure a beautiful presentation. This way you do not have to prepare anything on the table yourself. Lunch van huis was developed to answer the need for a healthy, tasty lunch, maximum service, but at a very competitive rate. Lunch van huis understands that you want the best lunch at the best price. You want to pay for the quality and the product but not for everything around it. Such as personnel costs or commissions. You also don’t want the products to be simply delivered at the door and that you then have to wash the dishes yourself. Lunch van huis combines the best of both worlds. So you have a complete solution for the best possible price-quality ratio. Our Buffet boxes and service really make the difference. We don’t provide staff on location, but ensure that everything is ready and cleaned up afterwards. We can even offer a self-scanning system so that employees can pay for their lunch on the spot. 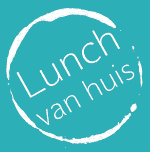 Lunch van huis was set up to offer a healthy, simple and affordable lunch without worries. We deliver lunch, but also do much more. We ensure the food is ready by the time you sit down and that lunch is also neatly cleaned up afterwards. This way we can deliver a full service without personnel costs on location. We prepare everything in our own kitchen and thus have control over our quality. Day in and day out we strive to provide lunch guests with a delicious lunch. Our concept, the Buffetbox, ensures that the lunch is ready immediately. Lunch van huis is driven and focuses on quality. We aim to deliver the best lunch for the best possible price.